The Best Back-Building Tips And Workouts From The Forums! In this article, you will find some great tips and workouts to help you get a wider back. In addition I am including some details of back anatomy. Check this out and also see what the forum members think. 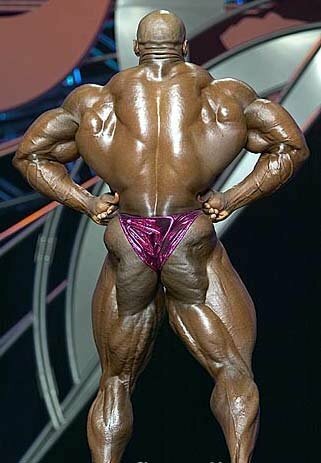 A big back is a huge asset to anyone in the sport of bodybuilding. That nice V-taper is what everyone dreams about in the gym. Having that nice wide back tapering all the way down to a tiny waist really accentuates your upper body size. Even though some people don't have the size waist that they always wanted, a wide back makes it appear as if their waist is a lot smaller than what it really is. In this article you will find some great tips and workouts to help you get a wider back. First let's talk a little about the back so you can fully understand what you are working in the gym during back day. The largest muscle of your back is by far the lats. 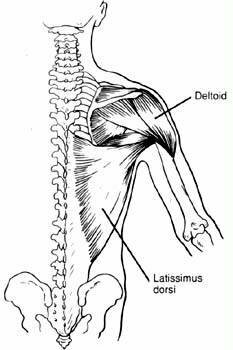 The latissimus dorsi starts all the way up at the upper end of the humerus, and runs all the way down to the pelvic girdle. The lats function is to pull the arm down towards the pelvis. Another powerful muscle of the back is the trapezius. The traps run all the way down the upper section of the spinal cord and attaches at the middle of your back. 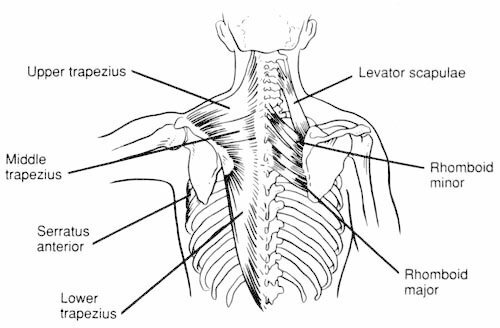 The traps have a couple main functions including: scapular adduction (bringing the shoulder blades together), scapular depression (pulling the shoulder blades down), and scapular elevation (shrugging). There are also some smaller muscles which aid in movement of the back such as the teres major and the rhomboids. The teres major is found at the outside edge of the shoulder blade and attaches all the way up at the humerus. The main role of the teres major is to bring the arm towards your back. The rhomboids are found on the spinal column and they attach to the middle of the shoulder blade. The rhomboids are used to bring the shoulder blades together. There are also a whole bunch of little muscles in the back which run along your spine. There is the erector spinae, which includes the longissimus, spinalis, and the iliocostalis. The erector spinae is a group of muscles that are in and support the spine as well as extend the spine. The erector spinae muscles are actually attached to the vertebrae, pelvis, and also to the ribs. Click Here For A Printable Log Of Andalite's Back Workout. "wide chins to chest, t-bar to gut, one-arm rows"
"The most underrated back exercises are pull up variations." "Keep it simple. Rows. Chins. Deadlifts. Do all 3 on the right diet and you'll start filling in your back." "I began widening myself out by concentrating on hitting the upper lats and teres major. Basically the area right behind your armpits was my main target. I started out doing weighted wide grip dead hangs, behind the neck pullups, and wide grip deadlifts. I then began doing weighted hammer chins with a narrower than shoulder width grip for actual lat thickness. "I have now graduated to lat flyes which hit the teres major right on point. Lat building is not a simple thing and less experienced lifters seem to take a while before they figure that out. Some people cannot attain full lat development from simply doing vertical rowing movements with one grip width because the grip you use can really affect how your lats are hit. "A shoulder width or narrower neutral grip will really hammer the lats from the lat belly up. While a wider overhand grip seems to only hit the outer/upper lats and bring the teres into play. Chin-ups seem to be best for overall lat sweep but they don't seem to hit the upper lats/teres quite as hard as pullups with a pronated grip do. Also most people cannot attain true lat thickness without some type of horizontal rowing movement such as bent over rows, t-bar rows etc. Building a great pair of lats takes a while and a lot goes into it. You might have to master different grips as well as rowing movements from various angles before you build a formidable pair." DB Pull-overs: lats, rear deltoids, triceps, chest and forearms. Lat Pull-downs: The lat pull-down works the lats, rear deltoids, biceps, and forearms. Chin-ups: The chin-up works that same muscles as the lat pull-down (i.e. the lats, rear deltoids, biceps, and forearms). BTN Lat Pull-downs: Lats, rear deltoids, biceps, and forearms. T-Bar Rows: This exercise works the lats, spinal erectors, traps, rear deltoids, biceps, and forearms. Seated Pulley Rows: This exercise is good for working the latissimus dorsi, spinal erectors, trapezius, biceps, and forearms. One-Arm Dumbbell Row: This exercise works the latissimus dorsi, trapezius, biceps, and the forearms. Barbell Rows: This exercise works the lats, spinal erectors, traps, rear deltoids, biceps, and forearms. Deadlifts: This is one of the best power building exercises that you can do. Deadlifts work the spinal erectors, quadriceps, buttocks, hips, forearms, trapezius, lats, and abdominals. Hyperextensions: This exercise is great for working the spinal erectors, buttock, and hamstrings. Good Mornings: This exercise works the spinal erectors, buttocks, and hamstrings." Is it best to do back or biceps first if done on the same day? "I prefer to hit the back first. I'd rather be 100% for back instead of biceps. my personal preference, find what works best for you. But remember to mix it up from time to time." "I'd say back first, but if you want to get the most out of your bis for more growth, do your bi's on a push day not a pull. Try doing bis on chest day, and tris on back day." "Always compounds first anyways, most back exercises involve biceps. So you should do back first and then kill your biceps with maybe 1 or 2 isolation exercises if you feel like you need to." "Back first for sure - It's a larger muscle group"